When the most ardent supporter loses all hope. Wide-eyed and staring into the abyss, all hope is gone, self-respect, and fortune destroyed. This is when markets bottom — not because a guru says so. Another week, another batch of same old, same old. “Bitcoin will rally in August,” says Wall Street’s cryptocurrency evangelist Tom Lee. The “statistic” in question? A technical analysis price pattern called an ascending triangle. You can’t make this stuff up. Dragons in the clouds. Paradoxically, something that seems real, like an ascending triangle, has no effect whatsoever on prices. Why? Because technical analysis is the study of what has happened in the past. It works only when enough traders turn up at the same time with enough focus to push prices higher. 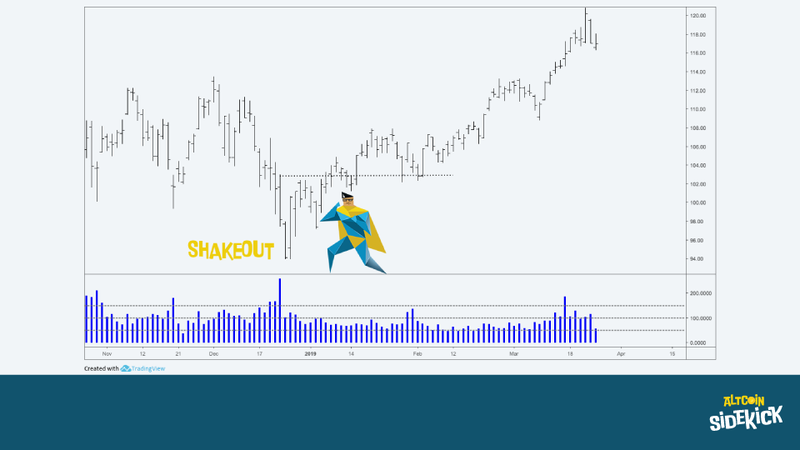 You can have a perfectly formed bullish pattern, a pattern that technical analysts use to predict higher prices, and, at the moment of breakout, as the chart reading technical analyst has their buy order filled, a massive sell order enters the market absorbing all the new technical buy orders, clearing out the bid side of the order book. One of the most difficult aspects of trading, whether it’s cryptocurrencies or crude oil futures, is giving up control. No matter what the pattern, if sell orders overwhelm buy orders, prices will go down. Prices don’t move because of price patterns, they move because new buying demand has overwhelmed the seller’s supply. Price patterns seem real, but have zero effect on future price movement. Is there something that’s not real that does? In the art world, it’s called chandelier bidding. Spend any time at an auction, and it won’t take you long to notice. The auctioneer knows the reserve price of all the works for sale. Art auctions are complex, and the leading houses compete with each other to attract business. Behind the scenes, deals take place where owners are sometimes offered or have negotiated, if they know what they’re doing, guaranteed percentages over and above the price achieved during the sale. The hammer price is not the price the new buyer will pay. The glitz and glamour of an auction do not come free. Added to the hammer price is the buyer premium, a negotiated amount paid on top. The buyer premium, an amount anywhere between 10% and 30%, depending on the art and the customer, is what the auction houses are doing there. It’s their commission, so it’s in their interest that the works they agree to auction are bid to the pre-agreed sale price. Everything is arranged before the sale takes place. Even the order and value of the works offered for sale are strategically placed for maximum effect. Nothing is left to chance. So, on a cold Thursday in December, the great and the good of the art world gather in London to buy and sell art. Being human, nobody likes to go first. So, a skilled auctioneer needs to warm up the audience because it’s the auctioneer's job to extract the most money from bidders. Not with a song and dance act, but with chandelier bidding. Every work of art has a price at which it’s offered for sale, this is the reserve, and to get things started and warm up the audience bids are taken, literally from the light fittings, yes, these are fake bids, the price goes up, but no one has placed an offer. Shock horror. You might think this is illegal. And, well, by the strictest letter of the law it is, yet it occurs at major auctions worldwide. Auction houses argue that opening the bidding with phantom bids bounced off the lights encourages buyers into the market. Critics say that phantom bids are misleading, and don’t give a fair account of the buying interest. 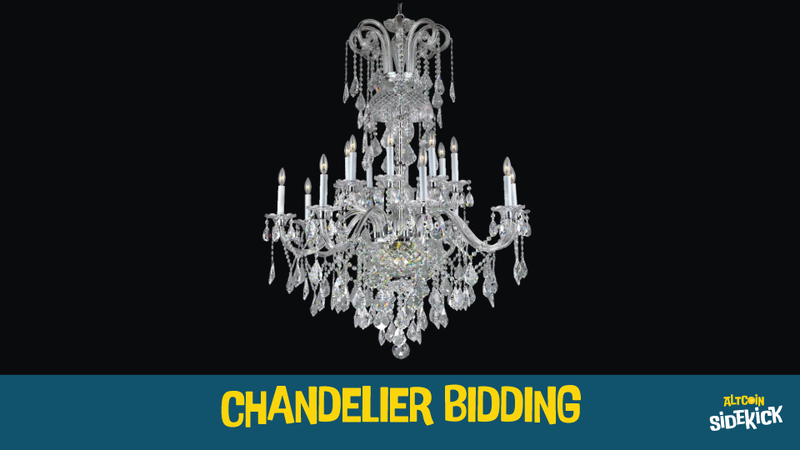 Chandelier bidding is a grey area, accepted as a way of opening the auction and getting it started, but not accepted when the work for sale reaches or has exceeded the reserve price, which is the agreed price the auction has negotiated with the current owner. When an auctioneer receives a bid higher than the reserve price, the artwork is going to be sold. The only question remaining is for how much? Think chandelier bidding is reserved for the art world? A recent article on CNBC reported that 95% of Bitcoin’s volume is faked by unregulated exchanges. CoinMarketCap.com shows around $8.9 billion of Bitcoin volume over the last twenty-four hours, and, if the report carried out by Bitwise is accurate, only $445 million of the volume took place with real trades. And this means over $8 billion was bounced off the chandeliers yesterday. If this is true, then the cryptocurrency market is much smaller and illiquid than it seems. Whenever sensational news breaks out on the major news outlets, it’s picked up and rehashed by all and sundry. In this case, Bitwise Asset Management did a survey and came to the conclusion that 71 out of 81 exchanges were wash trading. This is the cryptocurrency equivalent of chandelier bidding. Wash trading is done by simultaneously selling and buying the same instrument, in this case, Bitcoin, to give the appearance of a liquid market. Bitwise Asset Management publishes the results of its investigation, and the story is picked up and reported by the Wall Street Journal — the stalwart of financial newspapers — owned by Dow Jones Newswires, which in turn is controlled by Rupert Murdoch. Next, CNBC, the flagship financial channel owned by NBC Universal Broadcast, which in turn is owned by Comcast, runs the story. A sensational story like this is soon picked up by the comment and quote bridge, and in about five minutes there are articles all over the internet. At this point, conspiracy theorists might be rubbing their hands together. Let’s not do that; instead, let’s think about what this information actually means — if it’s true. A good starting point would be to find out what methods Bitwise used to classify trading volume as fake. One of the ways you can scan for fake trades is to analyse the spread between the bid and offer prices. Bitwise looked at one regulated exchange in the United States which averaged around $27 million in daily Bitcoin volume. The US exchange spread was around one cent. In contrast, another site, the largest reported exchange on CoinMarketCap.com, had a $15 spread, with some unregulated exchanges having spreads hundreds of dollars wide. The red flag? An exchange with 18 times more volume than the regulated US exchange had a spread 149,900% wider. The SEC, the United States Securities and Exchange Commission, recently rejected Bitcoin as a product on which to base an exchange-traded fund or ETF. The rejection rate was 84%. A Bitcoin ETF would have been a big deal and a possible catalyst for the cryptocurrency market. Over the last fifteen years, ETFs have been quietly eating up global stock markets. 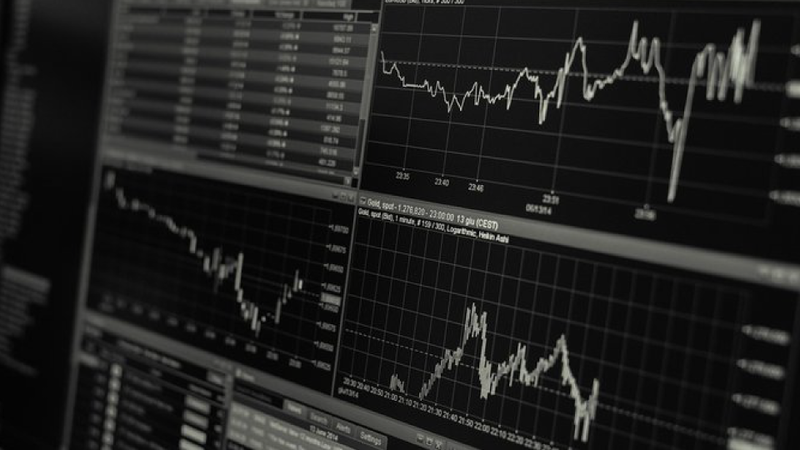 Bloomberg reported that, on average, 25% of all daily US stock volume turnover is attributed to trading in exchange-traded funds, but on an extreme day, ETFs can account for 40% of US stock market volume. The reasons given for SEC’s rejection are volatility and consumer protection. Headlines suggesting 95% of Bitcoin trading is fake only adds to the negativity surrounding cryptocurrencies as a legitimate asset. An 80% collapse in price, fake volume, SEC rejection, and CBOE, the Chicago Board Options Exchange, ending the trading of Bitcoin futures is enough to make all but the most committed cryptocurrency enthusiast throw in the towel. And, if the fake trading figures are correct, most probably have. While the majority have packed up and moved on to the next big thing, what are the corporations and the financial institutions doing? While they are showing you their right hand, are you noticing what they’re doing with their left? Are you a cryptocurrency proponent because of your beliefs? Do you see cryptocurrency as a mechanism to democratise your future prosperity, believing traditional methods of wealth building, like the aspiration to the American dream, have been destroyed by centralised institutional greed? If so, do you ever think about what is going on behind the scenes? History, as they say, does not repeat, but it does rhyme, and one constant is this: The majority never prosper from the launch of a new product, or paradigm. You’ll find plenty of examples if you take the time to research the price movement of stocks and even the real estate market. Take real estate, seventeen years ago the world’s central banks started aggressively dropping interest rates, and as a result, the cost of borrowing money went down, along with the interest rates on savings. It took about five minutes for the masses to decide to get into a new business — Flipping. Not burgers, but real estate. The next big thing was real estate as a retirement vehicle. It was the same during the initial dot-com boom in the late 1990s. Back then it was all about giving up your job and day trading stocks. What could be easier? The coolest new profession in town — until it ended. Starting in early March 2000, the Nasdaq index, being advertised as the stock market for the new century, hit an all-time high of 5,000. Pundits were making appearances on all the major financial news channels predicting the Nasdaq would soon overtake the Dow Jones Industrial Averages as the go-to bell weather index. Just one week later, one week after the Nasdaq breaking 5,000 made it onto everyday news channels, the Nasdaq made a high and started to decline. Two and a half years and 75% later, the Nasdaq hit bottom. Who was day trading stocks in October 2002? Yes, there’s always someone jumping up and saying me, me, me, but the point is the majority, the masses who thought their lives had changed, were brought back down to earth with a crash in tech stocks. You only hear stories of the ones who make it — they are very few and far between. Fifteen years. That’s how long it took for the Nasdaq to get back to its March 2000 high. Not a few months — years. The financial crisis of 2008 prompted extreme measures by the powers that be. With the click of a mouse, an unprecedented amount of money was brought into existence. Central banks created trillions of dollars of fiat currency out of thin air, resulting in record-breaking levels of national debt. Ten years later, and the United States national debt is over $22 trillion. The problem is, it’s such a large number most people can’t quantify it. You can imagine a room 20 feet by 10 feet, but what is $22 trillion? One technique is to convert the units, transforming, in this case, a dollar into a second. How long a period of time is $22 trillion seconds? It is 697,000 years. That’s a lot of debt. From the outrage of the financial crisis came Bitcoin. The idea was simple. A medium of exchange that couldn’t be devalued or manipulated. 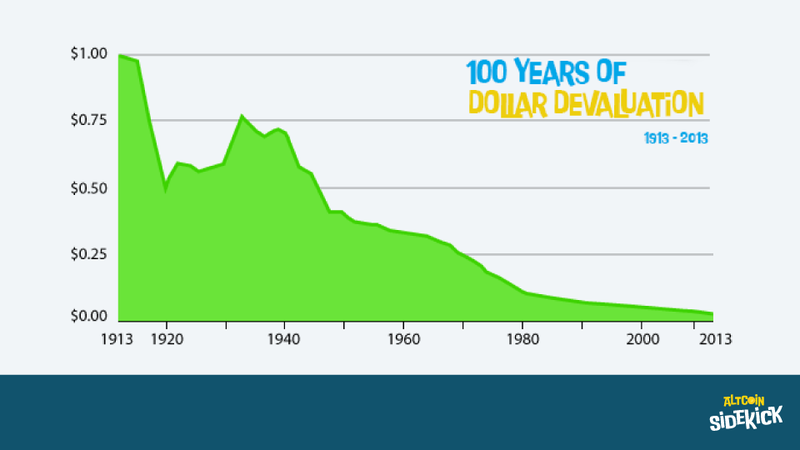 Since the creation of the US federal reserve in 1913, the buying power of the US dollar has been razed. $1 in 1913, has just under four cents of buying power today. A decline of over 96%. In 2009, Satoshi Nakamoto gave us Bitcoin, but apart from the few, even the meteoric rise in cryptocurrencies in 2017, did not change many lives. Yes, some people, made life-changing fortunes, but for most, they either missed out or bought at high prices. A good example of a Bitcoinesque rise is the US company Taser. Study the unadjusted prices of Taser, starting from its uninspiring initial public offering in 2001. Taser did nothing between its 2001 IPO and April 2003, but then, around late April 2003 Taser stock started to move. One year later Taser had gone up 7,000%. Mostly without the public. Bitcoin gave us a new word — blockchain. And it is blockchain technology that has the big players interested. It takes belief to keep your faith in an idea. That’s why the majority fail to exploit new markets. The masses, the 95%, don’t figure out their own ideas; instead, they listen to the opinions of others. At the first sign of trouble, the first batch bail, a few more shakes of the tree, and almost everyone else falls to the ground. Holding on takes belief in the new idea. While the news is bad, and the majority are walking away, the people who can guesstimate the likelihood of how a new product or service will be implemented in the future have an edge. Civil war veteran pharmacist John Pemberton only intended to create a medication for opiate addiction and upset stomachs. Odds are, over your lifetime, you’ve drunk gallons of it. It’s an icon of modern life, and it’s called Coca-Cola. In 1915, Harry Brearley was trying to make a gun barrel that wouldn’t rust. They called his new alloy stainless steel. Sometimes new ideas are happy accidents like the discovery of x-rays or penicillin, but occasionally new developments are used in a way the inventor never intended, like Coca-Cola or stainless steel. What if blockchains aren’t used as the inventor intended? Born out of distrust in centralised financial systems, Bitcoin gave us blockchains. In the future, what if blockchains are used for something other than their original intent? What if the early innovators are wrong? As a new invention moves from an initial trigger point casting it onto the world stage, traveling along the hype cycle on its way to either historical oblivion or mass adoption, the first users are usually the innovators. Early adopters of cryptocurrencies saw it as a way to side-step the manipulation of the global money system. A way to control their own funds, freeing them to move their assets around the globe, without the prying eyes of governments, and without the danger of devaluation. History, though, is full of irony. Early Bitcoin users espoused the benefits of using the cryptocurrency to break away from the centralised control of the international banking cartels. It’s impossible to know the future with 100% certainty, but some people do have a knack of being able to imagine what the future might look like. Faith Popcorn published ‘The Popcorn Report’ in the early 1990s, suggesting a future where society would cocoon into their homes. She wrote of ‘screen mail’ and ‘information buying’ years before the launch of the world wide web and the first web browser. In previous articles, podcasts, and videos, we’ve discussed the trilemma. A trilemma is a triangle, where, on each point, you place an idea or a choice. At any one time, only two of the three ideas can be true. Let’s say you placed globalism, democracy, and popularism on each of the three points; then, imagine a world where globalism was true, and the rise of popularism is true. This, in theory, means a decrease in democratic rights because, in the trilemma, only two points can be true at the same time. Globalism is the backbone of international business. It’s sticky, meaning it is not likely to change quickly, because if it did, the least of your problems would be how to protect your money. If globalism collapses quickly, then the world default currency would soon shift away from the US dollar and towards the baseball bat. Countries are becoming more distrustful of each other. This is seen in the rise of popularism and nationalism. International distrust leads to tariffs on trade and trade wars. In 2019, the two leading business superpowers, the USA and China, are flirting in and out of trade tariffs. Britain is in the throes of the Brexit debacle, and the United States is building a wall. The stakes are high, and the rhetoric is building. At the same time, international business is becoming more centralised. In China, to participate in society, you’re encouraged to use a “smart” device — a mobile phone, for all your payments. China has two huge companies, Alibaba and Tencent, (who owns WeChat) collecting data from all the smartphone interactions. In the West, Facebook and Google control most of all daily internet traffic. Amazon controls the largest share of online shopping, 50%, compared to the next biggest, eBay, who control around 6%. In the media, Comcast is swallowing up other media companies. More data is being collected than ever before, and it’s increasing. Currently, if traditional relational databases aren’t up to the task of secure storage or control can you think what new technology could step up and provide a solution? In China, there are 802 million internet users. 98.2% of them, or 788 million Chinese people, access the Internet via smartphones. Making payments, social media interaction, and gaming, are all generating data, and as we become more automated the more granular the data will become. The automation of society has a name. Capital Surveillance. As we’ve been busy tweeting, Facebooking, ordering takeaways, buying smart speakers, wearing smart watches, creating digital avatars of ourselves for free, a small number of organisations have become increasingly influential and powerful. Facebook, Google, and Amazon in the West. Alibaba and Tencent in the East. China uses its data in facial recognition systems. It’s way beyond what we are using in the Western world. You might have seen Google’s car driving around your neighbourhood building Google maps, but in Beijing Police surveillance vehicles are recording the faces of the population. Recently one of the databases was left unsecured, exposing 2.5 million records to potential hackers. History shows that governments have a history of using problems to instigate changes in society. Find the problem and bring in the solution. The irony is that a solution to a debt crisis, an idea born to democratise citizens control of their assets, could be used as a system of control. With data becoming more and more important, protecting it is the number one priority. If blockchains are used to solve this problem, then ask yourself what the likelihood of blockchains long term success is? With bad news all around, fake volume, SEC rejection, and the postponement of Bitcoin futures trading, it’s difficult for all but those who think in probability and likelihoods to hold on. Cryptocurrencies might not have made a final low. And even if they have, it can sometimes take years for a market to recover. The Nasdaq took nearly fifteen years to break its year 2000 all-time high. Microsoft took nine years of sideways trading in a base before it started a new long term uptrend. As the public loses interest and moves on, are the mega-corporations and financial institutions quietly manoeuvring, behind the scenes, making ready for the future with a pincer movement?